Jenny Florisson from Boarding Training Australia tells about how she uses the materials in the Living Archive in her work. 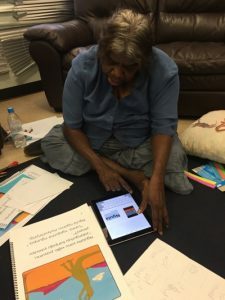 For some staff we train, when we look at the books on the Living Archive website, this is the first time they have seen books written in Kriol and other Aboriginal languages. We encourage Boarding staff to celebrate the languages of their Indigenous students, and to have stories and books available in Indigenous languages for students to read. To value a young person’s home language is vital. Many Aboriginal students speak several languages and some have had the opportunity to learn to read them. I have particularly enjoyed the Kriol stories and the students have a lot of laughs teaching me to read the story together. 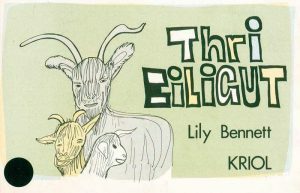 My favourite is “Thri Biligut” in Kriol, written and illustrated by Lily Bennett (Barunga). 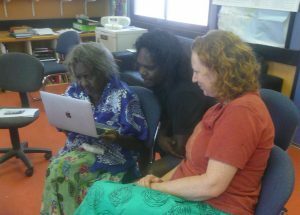 I have felt very privileged to sit with a young girl in her Boarding Residence in a remote Aboriginal community while she read me a story in Murrinh-Patha on the computer from the Living Archive website. Her pride and enjoyment at reading to me in her language was very obvious. I encourage Boarding staff to download the free books from the Living Archive and to print them out for their students to enjoy reading in their own language. This entry was posted in User stories and tagged testimonial on October 5, 2017 by Cathy Bow. The program will explore questions on the diversity of our collections, our profession and our audiences, as well as exploring the impact and potential of information technologies in indigenous communities and on traditional knowledge. Who are collections for? Who do they represent? Who should hold them, manage access and use, and communicate content? We know that collections in the GLAMR (Galleries, Libraries, Archives, Museums and Records) sectors contain representations of many different identities – cultural, ethnic, religious, political and sexual amongst many others – at points in time and over time. How should these myriad worlds be reflected to the wider community? What systemic changes are required to ensure new professionals entering the sector are a more diverse, broadly representative group than those who have come before? The Melbourne conference seeks to examine the commonalities and differences between sectors, collections and communities, as well as the many different worlds represented within them. The concept of Diverse Worlds – inclusive of the non-binary, different and divergent – also challenges notions of cohesion and a singular professional identity. It recognises that our community is not fully representative, and the collections for which we are responsible are not discoverable, accessible or understandable to many. We need to ask how we can go beyond mere consultation and engagement, and question whether supporting true diversity involves relinquishing authority, custodianship and control. The two keynote speakers for the ASA both distanced themselves from the archival profession, sharing frustrations with the lack of transformative power in the field as it currently stands. Verne Harris from the Nelson Mandela Foundation spoke about the power of transformational dialogue and its reliance on archives, giving examples from the South African experience, where “the struggle relies on the archive” such as in land restitution claims, outcomes of the Truth and Reconciliation Commission, state corruption, and the growth of inequality. He addressed the rhetoric of ‘hope’ but instead said that he has faith sustained by stories found in archive. The closing keynote speaker, Jarrett Drake, in solidarity with his compatriots’ protests against racial injustice, did his whole address on one knee. He spoke of his disillusionment with the profession of archiving, and how the claims of diversity within the Society of American Archivists are ‘dangerous, delusional and disingenuous.’ I’m guessing it’s not the first time he has spoken about the need to dismantle white supremacy to a room full of mostly white archivists and researchers. My hope is that his PhD research will lead to something that will shake up the profession in the same way that Paolo Freire’s “Pedagogy of the Oppressed” shook up education in its day. The plenary on the second morning focused on Evaluating the impact of Indigenous Collections: Going way beyond metrics project in NZ. 3 of the speakers focused on a recent on the impact of digitised material in Te Reo Maori archival collections, where much consultation with Maori community members led to an online survey of users, which revealed some of the practices of the users of these archival materials, and one of the speakers referred to “the growing democratisation of what was once rare knowledge.” It was good to hear about the ‘other end’ of the archiving process, how the materials that have been archived are used and what impact the process of archiving can have. It’s difficult to measure, and there are no standards for how to do it for Indigenous materials. Perhaps one outcome of this session is more discussion on what would be involved in identifying such standards? 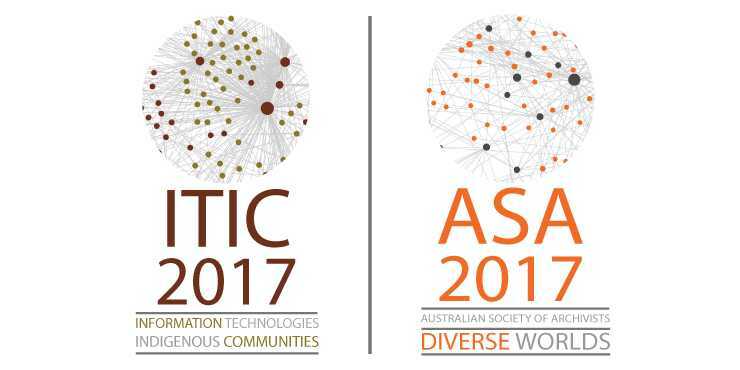 I had the opportunity to present the Living Archive of Aboriginal Languages at the session on ‘Web and Mobile Evaluation‘, where a panel of experts in usability/UX (User Experience), accessibility issues, and archives and technology issues gave feedback. One of the panel couldn’t access our site at all (an audience member suggested it was blocked at the workplace rather than a technical issue for our website, which has been working fine), but his feedback on the other sites motivated me to address issues of accessibility in our site. The UX expert only looked at the home page and didn’t get to the Archive at all – her comment was that “maybe because I’m a millennial, I ignore anything on the left or right of the page” so she missed the “click here to enter the archive” button. This means we should change where the URLs point to, so others don’t have the same experience and miss all the fun of exploring the archive itself.It was also recommended that the map instructions remain visible while users are navigating the map (currently they disappear and the selected language or community fills that space). Happily the third panel member was very positive about our site, having worked in remote NT schools and recognising the value of our project. The third day (ITIC) focused on the legacy of the late Dr Joe Gumbula, a senior Yolŋu songman who was also involved in important research to enhance knowledge of Indigenous archives and collections in Australia and internationally. Members of his family ‘smoked’ the participants in the grounds of Melbourne University, before a personal and moving keynote by Professor Aaron Corn about his mentor, father and colleague. This was accompanied by yiḏaki and singing by his brother and other Yolŋu musicians. After the later lecture, several people spoke warmly about the man and his legacy. As usual at conferences, it’s a great opportunity to network with others working in the same area, and I made some good connections and came back with lots of business cards and notes of things, references or people to follow up. 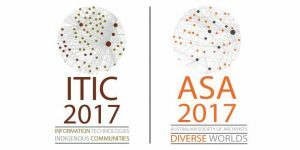 This entry was posted in Academic and tagged archiving, conference on September 29, 2017 by Cathy Bow. Living Archive project manager Cathy Bow reports on her visit to Ngukurr. It was such a delight to visit Ngukurr and spend a week with the wonderful staff at the Ngukurr Language Centre. I was able to go and meet a number of people in the community and show them the materials in the Living Archive, and talk about how they might be used in community. Ngukurr is a large Aboriginal community in southern Arnhem Land, situated on Ngalakgan land. Formerly a mission, the community population covers 8-10 heritage languages that are all now endangered. The main language spoken in Ngukurr today is Kriol but within the community, traditional languages are held in high esteem. The Ngukurr Language Centre is a small, independent, non-profit organisation. The goal of the Ngukurr Language Centre is to revitalise, document, teach and promote the traditional languages of the community via a range of community-based language programs. I had wonderful chats with the staff at the language centre, who are all passionate about their languages. Grant Thompson and Cherry Daniels and I looked at the Marra and Ngandi materials that were produced at the Language Centre and are now available on the Living Archive. They enjoyed reading the stories and looking at the photos. As a senior elder, Cherry was able to give permission for all the materials in those languages to be made public on our website, even those which don’t name the contributors. Angelina Joshua has her own story to tell about how her passion for Marra language ended up as an award-winning website for SBS called “My Grandmother’s Lingo.” I had the pleasure of watching Angelina teach a language class to a group of year 2 students from Ngukurr Community School – they were completely captivated by her, and were able to put together short sentences in Marra about animals and their own totems. Dean Austin Bara looked at the materials in Wubuy language from Numbulwar and considered how he could use them in teaching Wubuy at the school. He’s also keen to make his own new materials that will eventually go on the Archive site. I showed some of the Kriol materials to teachers and others from the school, who enjoyed reading the language that is most widely spoken in Ngukurr. Native speakers of either English or Kriol were able to read the stories, as Kriol is written very phonetically and the stories in the Archive are easy and fun to read. Talking with a number of people around the community, we found very positive attitudes to Kriol, and everyone we spoke to agreed that non-Indigenous people living in Ngukurr should learn to understand and use Kriol to build better relationships in community. 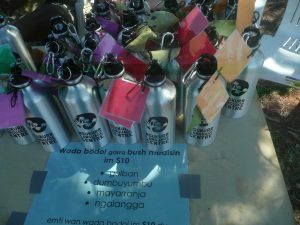 I was pleased to be able to attend the Ngukurr Festival, where the Language Centre was selling water bottles with the word for ‘water’ in all the local languages. The bottles were filled with local bush medicine, and were especially popular with the ‘munanga’ (non-Indigenous) in the community. This entry was posted in Activities and tagged community on September 21, 2017 by Cathy Bow. Each year the National NAIDOC Committee selects a theme for NAIDOC week (first week of July). This year’s theme of “Our Languages Matter” focused on “the importance, resilience and richness of Aboriginal and Torres Strait Islander languages” aiming “to emphasise and celebrate the unique and essential role that Indigenous languages play in cultural identity, linking people to their land and water and in the transmission of Aboriginal and Torres Strait Islander history, spirituality and rites, through story and song.” (http://www.naidoc.org.au/2017-national-naidoc-theme). 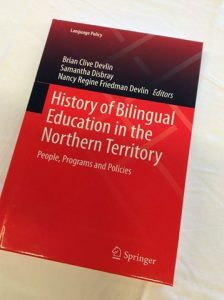 The other exciting event of the week was the launch of the book “History of Bilingual Education in the Northern Territory, edited by one of the chief investigators of the Living Archive project, Dr Brian Devlin, along with Dr Samantha Disbray and Nancy Devlin. 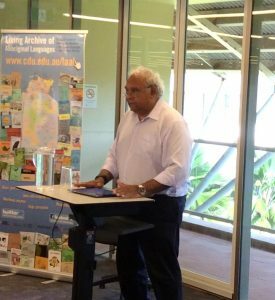 This important book has just been published by Springer, and was launched by the wonderful Professor Tom Calma, who back in 2014 also launched the Living Archive project in Darwin. This week’s book launch was a lovely celebration with many of the contributing authors in attendance, and others interested in issues surrounding bilingual education. Professor Calma even singled out the final chapter in the book, written by the Living Archive team, about the history and current status of the many books published in Literature Production Centres during the era of bilingual education, and their journey to digital formats on the Living Archive website. Also this week our project manager Cathy Bow presented her proposal for PhD research into the role of digital language resources in Australian Indigenous languages, which will focus on the Living Archive project as well as the Digital Shell project. On Saturday afternoon as part of the Darwin Fringe Festival we enjoyed another Treasure Language storytelling event, this time focusing on Indigenous language. After some initial talking about Why Languages Matter, we heard some traditional stories from Magdalen Kelantumama of the Tiwi islands told a creation story. Magdalen is a wonderful storyteller, and there are lots of her stories in the Living Archive, if you’d like to read some other stories like this. Then Yirriṉiṉba Dhurrkay told a story in Dhaŋu language, translated by Sylvia Ŋulpinditj , then an elder from Dhalinbuy told another story, which was accompanied by a buŋgul (traditional dance), which got many members of the audience up and dancing. What an incredible opportunity to experience traditional forms of storytelling and ceremonial activity in a theatrical space. Can’t wait to see more photos soon. On social media and other media we had a hard time keeping up with all the activities around the NT, much less nationally. I won’t even try to list them all but I do want to highlight just two. 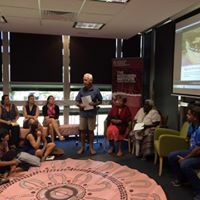 There was an article on The Conversation in Warlpiri language, about the significance of the Jukurrpa for Warlpiri people, and ICTV showed a documentary called Talking in the Top End about last year’s Kriol workshop. And that was just the events we got to attend, though we were very disappointed to miss out on the launch of Batchelor Institute’s CALL collection, with whom we’ve had a close and fruitful association (check out the collection here), plus the pop-up Arrernte language classroom in Alice Springs, and the NTLibrary’s wiki event, CDU’s NAIDOC Night at the Movies, and even a NAIDOC week march through the streets of Darwin. Even though NAIDOC week is officially over for the year, there are still a few related events coming up. At CDU’s Northern Institute this week we will hear from Professor Michael Walsh about how “Indigenous languages are good for your health“, and next month our colleagues from CDU’s School of Indigenous Knowledges and Public Policy will hold a language-focused event, and there is some work happening to celebrate some of the Indigenous language champions who have contributed so much over many years. So stay tuned for more celebrations of why Indigenous languages really do matter! 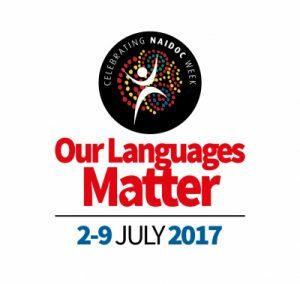 This entry was posted in Activities and tagged events, NAIDOC on July 11, 2017 by Cathy Bow. Our colleague Samantha Disbray published this article on The Conversation. Read the original article. Reproduced here with permission. Indigenous children can benefit greatly from learning in a language they understand. In this series, we’ll discuss whether progress is being made on Indigenous education, looking at various areas including policy, scholarships, school leadership, literacy and much more. Nancy Oldfield Napurrurla has taught at Yuendumu school for over 30 years. In her preschool transition class, the children attentively sing along in Warlpiri to Marlu Witalpa (Little Kangaroo). It’s a seemingly simple children’s song about a kangaroo looking for its mother. But with its complex expressions and traditional hand signs, it’s also an effective tool for learning. Nancy has introduced generations of children to school routines, literacy, and early years knowledge and skills all in a language they understand: Warlpiri. At the same time, they learn oral English from another teacher in a staged curriculum. As they master some English language, they are introduced to English literacy. This dual language approach is based on research showing that many concepts are best learned in the language that the learner understands. And mastery in first language supports second language learning, success in literacy and academic achievement in both languages. Increasingly, international and Australian research and policy make strong links between recognition and use of first language and cultural knowledge, and student identity, wellbeing and education outcomes. 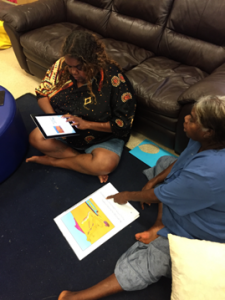 Teachers in Warlpiri-English and other bilingual schools, such as Yirrkala school, have long worked to innovatively blend traditional and contemporary knowledge. The overarching aim of this dual language focus is to provide young people with the skills they will need as bicultural adults in the modern world. This is relevant in sectors such as the arts, land management, interpreting in legal and health settings and education, to name just a few. The importance of bilingual education was recognised more than 50 years ago when, in 1961, politician Kim Beazley Senior saw a classroom like Nancy’s at Hermannsburg school in central Australia, where children were learning in Arrernte and English. The success of this classroom, compared with its English-only counterparts, inspired him. Later, as education minister in the newly elected Whitlam government in 1972, he oversaw the launch of the Northern Territory Bilingual Education program. These early days and the decades that followed are documented in a new volume, History of Bilingual Education in the Northern Territory. At its most ambitious in 1988, 24 remote schools had programs in English and 19 Aboriginal languages. Local people were directly involved in the education of their children, and champions for schooling in remote communities. The schools desperately needed Aboriginal teachers, and training programs were developed through the establishment of Batchelor College and the School for Australian Linguistics (now combined as Batchelor Institute for Indigenous Tertiary Education). 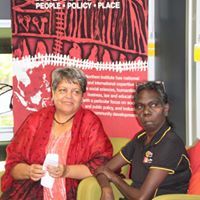 Many Aboriginal people, like Nancy, often of the first or second generation in their families to attend school, were supported by their school and the department to obtain professional qualifications and leadership opportunities. 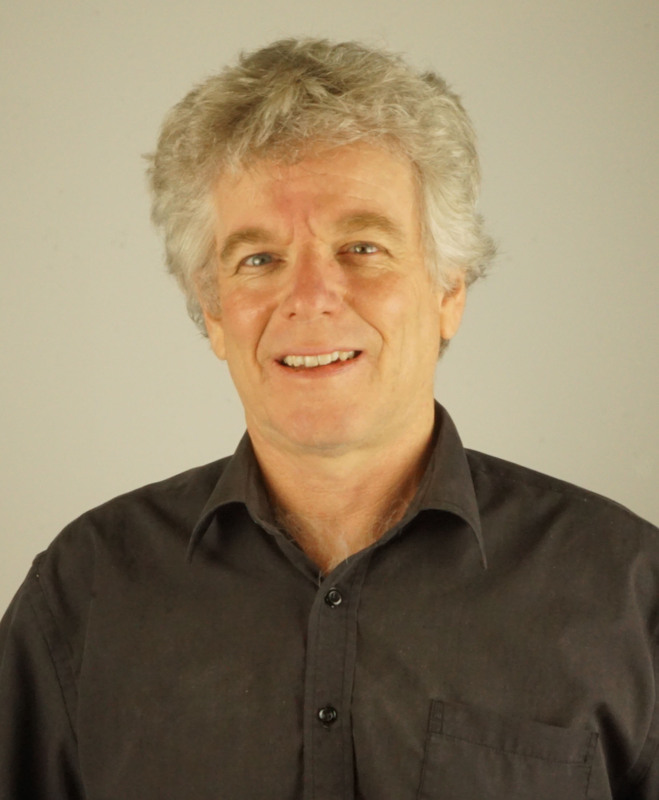 These opportunities were provided by combinations of in-community on-the-job learning, intensive courses at Batchelor College, and support from travelling Batchelor College lecturers. However, in the intervening years, changes to accreditation regimes and changes to Batchelor College funding have meant that these opportunities are now rarely available to Indigenous people in remote communities. Sadly, there are fewer qualified Aboriginal teachers in remote Australia today than in the 1980s. Indigenous teachers worked side by side with non-Indigenous teachers in bilingual teaching teams. This required professional development in the skills of team teaching, and teaching English as an Additional Language or Dialect (EALD). Non-local teachers were trained, supported on the job and/or accessed professional learning in these skills. This support was not only essential for young non-local teachers to acquire these skills, it also provided them with social and intellectual support that helped them stay longer on communities. The need for trained English language teachers and structured EALD programs in remote schools has been raised in virtually every report since the 1990s. The lack of these skilled professionals continues to hamper Aboriginal students’ learning English and academic success across the Northern Territory. The dual language focus created jobs in remote communities, not just in teaching. With a great need for written materials to support the program, Literacy Production Centres were established, with a prodigious output of books. These included fiction, history, science and reference works in Aboriginal languages. Recently much of this has been made digitally available in the Living Archive of Aboriginal Languages. Despite efforts to promote the dual language focus and its importance to communities, it remained controversial, and subject to shifts in policy and resourcing. Ideological disagreements often drowned out evidence and the opportunity to review and improve practice. While much has changed since 1972, recent research shows the continued importance of community involvement in schools. Now in 2017, the Northern Territory Education Department is preparing policy and developing curriculum for teaching Aboriginal languages, including the remaining bilingual programs, based on the new National Curriculum. These moves recognise the value of Aboriginal languages in education and employment. But policy and curriculum on their own are not enough. Aboriginal classrooms need more Nancy Oldfields, more trained teachers from their own communities who speak their own languages. The Western Australian Department of Education has a practical and innovative model to achieve this. Classrooms need more trained teachers who are skilled in teaching oral and written English to children who speak other languages. And they need these teachers to be skilled in working together as professional teams. This is where Australia needs to invest in Aboriginal education – in teacher education, professional learning and team-teaching, and excellence in languages education. • Read more articles in this series. This entry was posted in Academic and tagged Conversation on June 16, 2017 by Cathy Bow. This is a guest post from Barbara Martin, Samantha Watson, and Gretel Macdonald from Yuendumu School. They sent us a fantastic video produced from a book available in the Living Archive collection, and we asked them to share how they made it, so others can try as well. 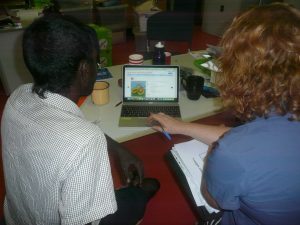 Of course an audiobook can’t replace the skill of a Warlpiri teacher, but it is still a valuable resource. How did we make the audiobook…? Well we started by choosing a book that is popular with kids and adults. We had a think about how we would put the images and the text together using Adobe Spark, and decided that we wanted to add a few more images to bring this story to life. Otherwise the hungry mulyurlinji (perentie) just eats each lizard he meets and the story is all over too quickly! That’s the great thing about making an audiobook – you can be the director and be as creative as you want to be. Once we had all the images figured out, and Barbara had learned from us younger ladies how to use an iPad along the way, we had to record our voices reading the book. This was challenging, and Barbara had to help us younger ladies to practice, and practice and practice (!) and think about the rhythm of Warlpiri, and how we would use our voices to play different characters. Now that we have made one audiobook we want to make more, and most importantly we want to get kids at Yuendumu School involved in making their own audiobooks. You can also view this on the Living Archive website – go to http://laal.cdu.edu.au/record/cdu:34270/info/ and click on WATCH (go full screen to get the whole effect!) And send us your ebooks or audiobooks when you’ve created them. This entry was posted in User stories and tagged community, eBooks on March 22, 2017 by Cathy Bow. We’ve just had a new article published which shows how materials from the Living Archive can be used in all learning areas of the Australian Curriculum. It addresses the cross-curriculum priority of Aboriginal and Torres Strait Islander histories and cultures, which need to be incorporated in all subjects according to the Australian Curriculum. The article is open access, and free to download here. We’ll soon create a space on this site where teachers can select their learning area and find examples that can be used, or ideas of what materials to look for. Bow, C. (2016). Using authentic language resources to incorporate Indigenous knowledges across the Australian Curriculum. Learning Communities: International Journal of Learning in Social Contexts [Special Issue: New Connections in Education Research], 20, 20-39. DOI: http://doi.org/10.18793/LCJ2016.20.03. The promotion of Aboriginal and Torres Strait Islander histories and cultures as a cross-curriculum priority in the new Australian Curriculum provides both a challenge and an opportunity for teachers and teacher educators. 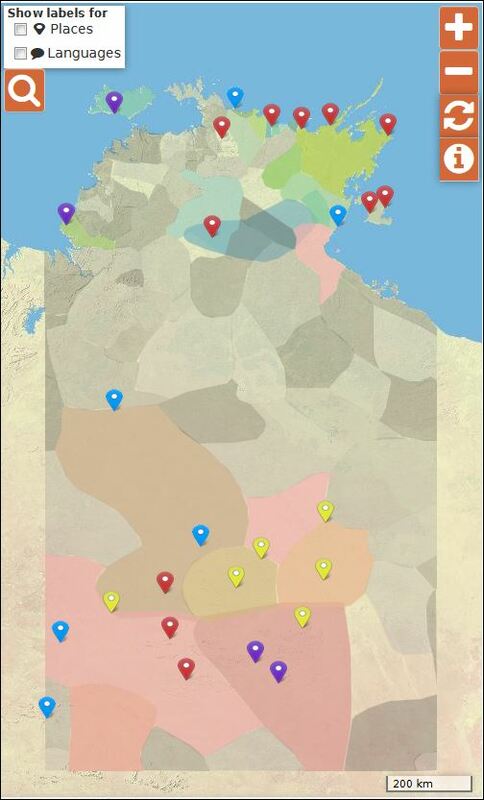 The Living Archive of Aboriginal Languages contains authentic language materials which can assist in resourcing and supporting teachers to meet this challenge across all areas of the curriculum, and to encourage connections with Indigenous cultural authorities. This entry was posted in Academic and tagged curriculum, teaching on November 28, 2016 by Cathy Bow. 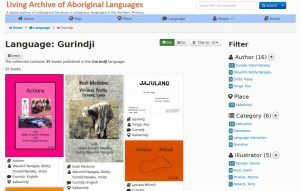 As head of languages at Meriden school (Strathfield NSW) until 2015, I was very grateful to discover the materials available for the Warlpiri and Anmatyerr languages on the Living Archive of Aboriginal Languages website. The school has a relationship with the Ti Tree community in the Northern Territory and there is a group of students from the community studying at Meriden. These students bring a rich cultural and linguistic heritage to our school community, which I am always interested in helping them share with the broader school population. When I showed the Living Archive of Aboriginal Languages to the Ti Tree students, they were really interested to see stories and books produced in their language by people they know. We were able to download a couple of the stories and have them bound into booklets. These were used to help students share stories in their language. Sincere thanks to all who have contributed to this site, from the hard-working community members to the site creators and administrators. If you have a story about using the materials in the Living Archive, contact us! This entry was posted in User stories and tagged school, testimonial on November 16, 2016 by Cathy Bow.